Since the Automatron Rig is pre-built the only rigging you will need to do is fitting the Automatron Rig to your character. The Bot Scaler Panel make this easy. All figure pose adjustments can be done in symmetrical or asymmetrical modes. 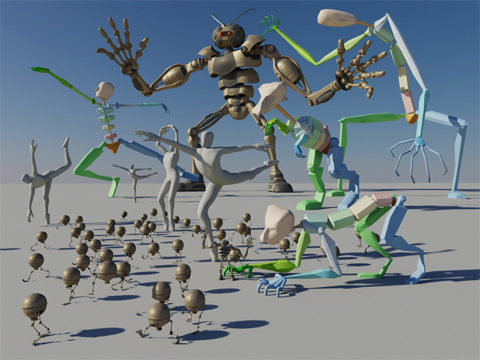 The main bones of the rig can be morphed into a wide variety of shapes to give each character rig a unique appearance. As long as your character is built with the same bipedal format of two arms, two legs, 10 fingers and a head, the Automatron rig can fit just about any character.